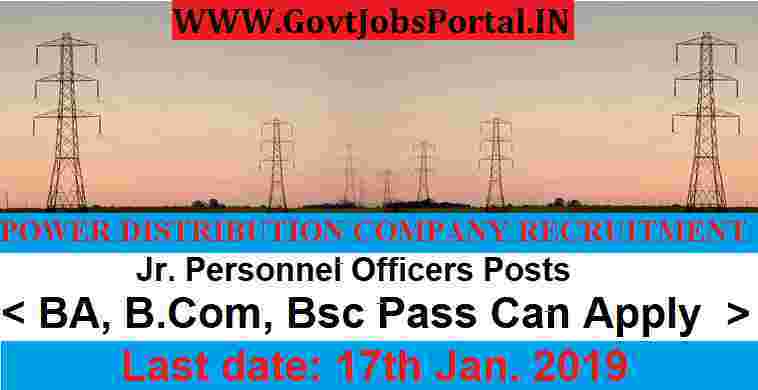 Latest Govt jobs for Jr. Officers in Power Distribution Company 2019. All Indian candidates are eligible for applying this recruitment procedure through online process only. We found the official NOTICE related to this recruitment process from the official website of TSNPDCL Department, the link of that website is as follow: “http://www.tsnpdcl.in/”. The Official PDF file LINK from which we gathered this information and shared in this article is given under IMPORTANT LINK section at the LAST of this article. Northern Power Distribution Company of Telangana Ltd. (TSNPDCL) was incorporated under the Companies Act, 1956 as a Public Limited Company on 30-03-2000 with headquarters at Warangal to carry out electricity distribution business as part of the unbundling of erstwhile A.P.S.E.B which caters the supply of electricity in 5 combined districts i.e., Warangal, Karimnagar, Khammam, Nizamabad and Adilabad. 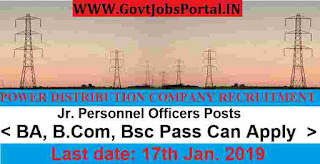 Government Job Applications are invited On-line from all well qualified applicants through the proforma Application made available on TSNPDCL WEBSITE www.tsnpdcl.in and http://tsnpdcl.cgg.gov.in to the post of Junior Personnel Officer in Personnel & General Services of TSNPDCL. More information related to this Power Distribution corporation is given below in this article. Pay Band: Rs.34,925 – Rs.66,420 Per Month. Educational Conditions: Those applicants who have successfully completed their Graduation under following stream: “ BSc, BA, B.com” with 60% marks can apply for these Government jobs for Officer posts. Those who satisfied this age conditions can apply online for these Government jobs. 28TH Dec. 2018 is the Start Date to apply. 17th Jan. 2019 is the Last Date to apply.